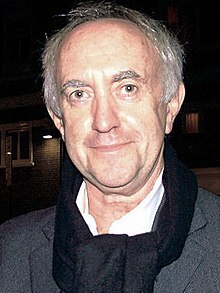 Jonathan Pryce CBE (born John Price; 1 June 1947) is a Welsh actor and singer. After studying at the Royal Academy of Dramatic Art and meeting his longtime girlfriend, English actress Kate Fahy, in 1974, he began his career as a stage actor in the 1970s. His work in theatre, including an award-winning performance in the title role of the Royal Court Theatre's Hamlet, led to several supporting roles in film and television. His breakthrough screen performance was in Terry Gilliam's 1985 cult film Brazil. Critically lauded for his versatility, Pryce has participated in big-budget films including Evita, Tomorrow Never Dies, and Pirates of the Caribbean as well as independent films including Glengarry Glen Ross, The Age of Innocence, Carrington, The New World, and The Wife. His career in theatre has also been prolific, and he has won two Tony Awards—the first in 1977 for his Broadway debut in Comedians, the second for his 1991 role as The Engineer in the musical Miss Saigon. Initially in 2015, Pryce was a guest actor in the HBO series Game of Thrones as the High Sparrow before becoming a main cast member in 2016. Since early 2017, he stars in the series Taboo, playing the role of Sir Stuart Strange. Born John Price in Carmel, Flintshire, he is the son of Margaret Ellen (née Williams) and Isaac Price, a former coal miner who, along with his wife, ran a small general grocery shop. Pryce has two older sisters. He was educated at Holywell Grammar School (today Holywell High School), and, at the age of 16, he went to art college and then started training to be a teacher at Edge Hill College (now Edge Hill University) in Ormskirk. While studying, he took part in a college theatre production. An impressed tutor suggested he should become an actor and, on Pryce's behalf, applied to the Royal Academy of Dramatic Art for an application form; Pryce was awarded a scholarship to RADA. When he joined Equity he used Jonathan Pryce as his stage name because Equity will only have one actor with any particular name on its books. While at RADA Pryce worked as a door-to-door salesman of velvet paintings. Pryce was part of a 'new wave' of actors to emerge from the Academy. Others included Bruce Payne, Juliet Stevenson, Alan Rickman, Anton Lesser, Kenneth Branagh and Fiona Shaw. In 1980, his performance in the title role of Hamlet at the Royal Court Theatre won him an Olivier Award, and was acclaimed by some critics as the definitive Hamlet of his generation. That year, Pryce had a small but pivotal role as Zarniwoop in the 12th episode of the Hitchhiker's Guide to the Galaxy radio series, one that he reprised for the Quintessential Phase which was broadcast in 2005. In his original role as Zarniwoop, Pryce's character questions the "ruler of the Universe", a solipsist who has been chosen to rule arguably because of either his inherent manipulability, or immunity therefrom, on his philosophical opinions. Around the same time, in 1980, he also appeared in the film Breaking Glass. In 1983, Pryce played the role of the sinister Mr. Dark in Something Wicked This Way Comes, based on the Ray Bradbury novel of the same title. After appearing mostly in films, such as the Ian McEwan-scripted The Ploughman's Lunch, and Martin Luther, Heretic (both also 1983), he achieved a breakthrough with his role as the subdued protagonist Sam Lowry in the Terry Gilliam film, Brazil (1985). After Brazil, Pryce appeared in the historical thriller The Doctor and the Devils (also 1985) and then in the Gene Wilder-directed film Haunted Honeymoon (1986). During this period of his life, Pryce continued to perform on stage, and gained particular notice as the successful but self-doubting writer Trigorin in a London production of Anton Chekhov's The Seagull in late 1985. From 1986 to 1987 Pryce played the lead part in the Royal Shakespeare Company's production of Macbeth, which also starred Sinéad Cusack as Lady Macbeth. Also in 1986 he starred in the film Jumpin' Jack Flash. While working at the Everyman Theatre in 1972, Pryce met actress Kate Fahy whom he married in 2015. They based their home in London, where they currently live. They have three children: Patrick (born 1983), Gabriel (born 1986), and Phoebe (born 1990). Pryce was appointed a Commander of the Order of the British Empire (CBE) in the 2009 Birthday Honours. 1976 BBC2 Playhouse Playleader Episode: "Play Things"
Bill Brand Jamie Finn Episode: "It Is the People Who Create"
Chalk and Cheese Dave Finn Episode: "Pilot"
Theatre Box Drippens Episode: "School for Clowns"
1988 Tickets for the Titanic Rev Richard Hopkins Episode: "Everyone a Winner"
The Storyteller King Episode: "The Three Ravens"
1990 Screen Two William Wallace Episode: "The Man from the Pru"
The Jim Henson Hour King Episode: "Food"
HR (2009, BBC) – a five series comedy drama series on BBC Radio 4. ^ Shenton, Mark (15 October 2007). "Jonathan Pryce Archived 18 January 2008 at the Wayback Machine". Broadway.com in London. Retrieved 10 November 2007. ^ BWW News Desk (20 November 2005). "Jonathan Pryce Confirmed To Step Into 'Dirty Rotten Scoundrels'". BroadwayWorld.com. Retrieved 10 November 2007. ^ a b (16 August 2002). "I always wanted to be a pop star...". The Guardian. Retrieved 9 December 2007. ^ (8 October 2007). "Why Jonathan Pryce is right for Mamet". The Daily Telegraph. Retrieved 15 June 2008. ^ (10 July 2001). "Life with lots of Doolittles". The Daily Telegraph. Retrieved 15 June 2008. ^ a b (6 March 2007). "Jonathan Pryce is Sherlock Holmes". BBC.co.uk. Retrieved 28 October 2007. ^ "Jonathan Pryce Mini Biography". Ön Sayfa. Retrieved 28 October 2007. ^ The RSC Shakespeare – Plot summaries, The Taming of the Shrew Archived 22 August 2010 at the Wayback Machine. Retrieved 18 June 2008. ^ The RSC Shakespeare – Plot summaries, Antony and Cleopatra Archived 3 December 2008 at the Wayback Machine. Retrieved 18 June 2008. ^ "Laurence Olivier Awards: Past winners Archived 12 December 2003 at the Wayback Machine". The Society of London Theatre. Retrieved 6 November 2007. ^ "Entertainment Weekly's Top 50 Cult Movies (Brazil #13) Archived 31 March 2014 at the Wayback Machine". FilmSite.org. Retrieved 26 November 2007. ^ "Jonathan Pryce's Biography Archived 20 December 2008 at the Wayback Machine". The Theatre Royal Haymarket website. Retrieved 26 November 2007. ^ The RSC Shakespeare – Plot summaries, The Tragedy of Macbeth Archived 23 December 2014 at the Wayback Machine. Retrieved 18 June 2008. ^ "Losing The Light – Terry Gilliam & The Munchausen Saga (a summary)". Hal Leonard Online. Retrieved 6 November 2007. ^ "The Adventures of Baron Munchausen". Box Office Mojo. Retrieved 6 November 2007. ^ ""Whose Line is it Anyway?" – Episode Guide – Series one (1988)". WhoseLine.net. Retrieved 26 November 2007. ^ a b c (18 March 2003). "Work with Martine again? I think not". Daily Telegraph. Retrieved 15 June 2008. ^ Shenton, Mark (15 June 2008). "Q&A – Jonathan Pryce Archived 18 January 2008 at the Wayback Machine". Broadway.com in London. Retrieved 15 June 2008. ^ "Jonathan Pryce Biography". Allocine.co.uk. Retrieved 26 November 2007. ^ O'Keefe, Robert (20 September 1999). "Miss Saigon 10th Anniversary show 1990 Review". London Theater Guide Online. Retrieved 26 November 2007. ^ Rothstein, Mervyn (8 August 1990). "Union Bars White in Asian Role; Broadway May Lose 'Miss Saigon'". The New York Times. ^ Rich, Frank (10 August), 1990). "Jonathan Pryce, 'Miss Saigon' and Equity's Decision (page 3)". The New York Times. Retrieved 6 November 2007. ^ ""Miss Saigon: Bringing Discrimination into the Limelight"". Archived from the original on 12 November 2007. Retrieved 16 October 2010. CS1 maint: BOT: original-url status unknown (link). Retrieved 6 November 2007. ^ Rothstein, Mervyn (19 September 1990). "Dispute Settled, 'Miss Saigon' Is Broadway Bound". The New York Times. Retrieved 6 November 2007. ^ "Dark Blood". RiverPhoenix.org. Retrieved 6 November 2007. ^ "Videos". George Sluizer's official website. Retrieved 19 November 2007. ^ Meredith, Robyn (13 June 1996). "The Media Business: Advertising;Infiniti chooses artsy ads with musings about the meaning of life to sell its luxury cars.". The New York Times. Retrieved 6 November 2007. ^ Jones, Kenneth (10 March 2006). "Playbill.com's Brief Encounter with Jonathan Pryce Archived 29 December 2008 at the Wayback Machine". Playbill. Retrieved 9 December 2007. ^ "Festival de Cannes: Carrington". festival-cannes.com. Retrieved 2 September 2009. ^ Thomas, Rebecca (22 March 2001). "Fair Lady's luvverly show". BBC News. Retrieved 10 November 2007. ^ Connema, Richard. "American Premiere of Wesley Moore's A Reckoning is a Challenging Father/Daughter Confrontation". Talkin' Broadway. Retrieved 15 June 2008. ^ Clover, Brian (19 April 2004). "The Goat or Who is Sylvia?". Curtain Up. Retrieved 19 January 2008. ^ Loveridge, Lizzie (4 February 2004). "The Goat or Who is Sylvia?". Curtain Up. Retrieved 19 January 2008. ^ (21 February 2005). "The Olivier Awards 2005 Archived 20 December 2008 at the Wayback Machine". The Society of London Theatre. Retrieved 19 January 2008. ^ Milling, Robin (21 September 2006). "Jonathan Pryce puts his voice on Archived 20 December 2008 at the Wayback Machine". Artisan News. Retrieved 16 November 2007. ^ "Chapter 7 – Return to The Bahamas Archived 9 May 2012 at the Wayback Machine". Pirates of the Caribbean, Full Production Notes. Retrieved 10 November 2007. ^ (20 November 2005). "Jonathan Pryce Returns to Broadway Stage Archived 10 July 2011 at the Wayback Machine". eWoss News. Retrieved 5 November 2007. ^ de Jongh, Nicholas (10 October 2007). "Blackmail, greed, despair ... a tale for our times". Evening Standard (London). Retrieved 15 June 2008. ^ "Game of Thrones season five cast announced at Comic Con!". Watchers On The Wall. 25 July 2014. Retrieved 10 October 2014. ^ "Interview Roundup: John Bradley, Jonathan Pryce, and many more!". Watchers On The Wall. 3 March 2015. Retrieved 3 March 2015. ^ Etan Vlessing (13 May 2015). "Camilla Luddington, Jonathan Pryce Board Rom-Com 'The Healer'". The Hollywood Reporter.